It seems that news about the fixing of trillion dollar markets is becoming, well, rather routine. First there was Libor, then there was the announcement that the Commodities Futures Trading Commission (CTFC) was investigating the possible rigging of the interest rate swap rate, another market in the hundreds of trillions. Then in mid-April the EU announced that it was investigating possible price manipulation in the $165 trillion physical-oil market. That's three price fixing scandals slap bang on each other's heels, all involving trillion dollar markets. The public have not yet got worked up about the first two since the instruments involved are so far out of the ordinary person's view that the response, if you stopped someone on the street would be, "Sorry, never heard of it..."
The alleged oil price scandal, however, could strike a lot closer to home. 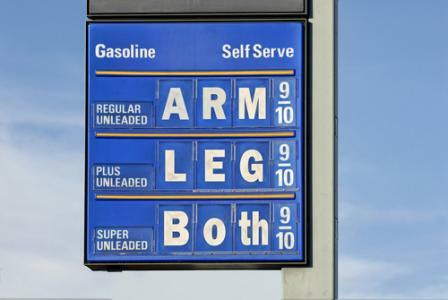 Motorists around the world are already furious over the cost of petrol and diesel at the pumps. While the vast majority of them probably feel that the oil companies are profiteering, the general feeling seems to be "Oh well, thing are as they are...” But if it transpired that instead of just being opportunistic, some of the major oil companies were actually involved in criminal activity, things could get ugly. Being a banker was almost a dangerous career to be in, for a few years after the smash, and bankers are not wholly out of the woods yet. Being an oil company executive could soon attract similar opprobrium if the EU investigation turns up any wrong-doing. A hate campaign against the oil companies, in a world that continues to run on oil and gas despite the strides being made in renewables, would not be a good thing. Related: Are Oil Prices Rigged? The EU began with an investigation into possible price fixing by Royal Dutch Shell, BP and Statoil, three of Europe’s biggest oil exporters. According to Bloomberg, EU investigators have now asked Neste Oil, Finland’s only refiner, to provide them with information regarding the potential manipulation of global crude and biofuels markets. Bloomberg also reported that Pannonia Ethanol, a Hungarian bio-fuels producer, has lodged a complaint with the European commission after it was denied the opportunity to contribute to the price setting process carried out by data-price setting company, Platts. There is plenty of speculation that the EU investigation will widen out pretty rapidly once the investigators start going through oil company emails and memos. Neste has said it is not a target of the investigation but will provide information into the investigation. Refineries, as major buyers of crude, are in a good position to know if they have been facing price fixing by supposed competitor suppliers, so their contribution is bound to be at least interesting. EU cartel type probes are always serious, with potentially stratospheric fines associated with them. However, the patience of leading politicians is also wearing incredibly thin as one scandal after another comes sweeping in to upset the markets. UK Prime Minister David Cameron is already calling for any oil executives found guilty of price fixing to face the full force of criminal proceedings. However, Total SA Chairman and CEO Christope de Margerie, is in print as saying that he would be very surprised if the EU investigation does in fact turn up price fixing activities. “The system is not perfect, but that does not mean that there is price fixing,” he commented. It doesn’t, but then again, it doesn’t mean that there isn’t price fixing either. It will be interesting – and potentially hugely damaging for any guilty parties – to see what the EU does manage to prove. Either way though, the markets did not need yet another scandal. How rigged are the markets? Libor, ISDAfix, and now the oil price... is republished with permission from the QFinance Blog. Get the QFinance Dictionary of Business and Finance iOS app for a comprehensive guide to financial terms and expressions.